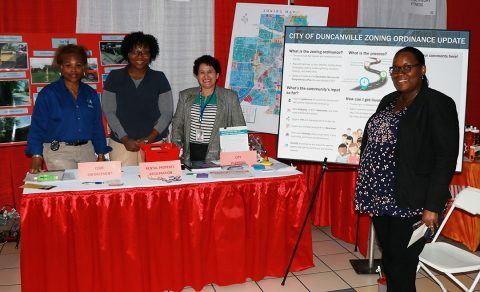 The City of Duncanville is hosting a community meeting seeking citizen input about Destination Duncanville, the Comprehensive Plan, on Wednesday, June 21. Destination Duncanville is the long-term vision for the City targeting growth areas and specific locations for revitalization-focused efforts. Development of this plan is nearing completion and has been underway since August 2016 with a series of Steering Committee meetings, community and stakeholder meetings, an online survey, and Planning and Zoning Commission and City Council workshops. Public input has generated the basis of the plan. A summary of input received, elements of the draft plan and proposed recommendations and strategies to implement the public’s vision will be reviewed during the community meeting. Citizens will have an opportunity to participate in interactive exercises and discussion facilitated by the consultant, Freese and Nichols, Inc.
Check-in for the meeting begins at 6:30 pm with the meeting starting at 7 pm and will be at the D.L. Hopkins, Jr. Senior Center (206 James Collins Boulevard, Duncanville). What: The City of Duncanville will host a Downtown Stakeholders Meeting to seek citizen input on the downtown element of the Comprehensive Plan. The intent is to discuss the existing Downtown District boundary, challenges and opportunities for future development within downtown. The meeting is geared toward property owners and business owners within the Downtown District but is open to the public. The meeting will be an opportunity for citizens to participate in interactive exercises and discussion facilitated by the consultant, Freese and Nichols, Inc. The goal of the meeting is to walk away with a basis of understanding of what the community deems as important as it relates to downtown Duncanville. Community participation through events like the Downtown Stakeholders Meeting is vital for the comprehensive plan development process. For more information on the Comprehensive Plan, please visit: www.DestinationDuncanville.com. When: Wednesday, October 12, 2016; check-in begins at 6:30 p.m., meeting begins at 7:00 p.m. The meeting is being hosted in partnership with the consultant Freese and Nichols, Inc., which has offices around the country and throughout the State.